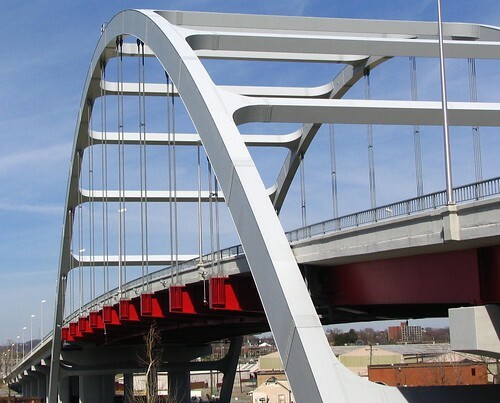 This is the bridge which was originally known as the Gateway Bridge, which opened in Nashville in 2004 and crosses the Cumberland River close to downtown. 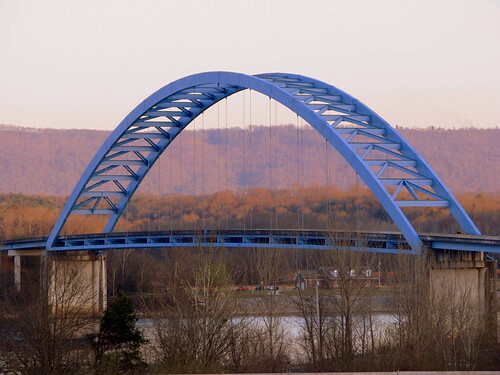 This is also Nashville's first arch bridge. 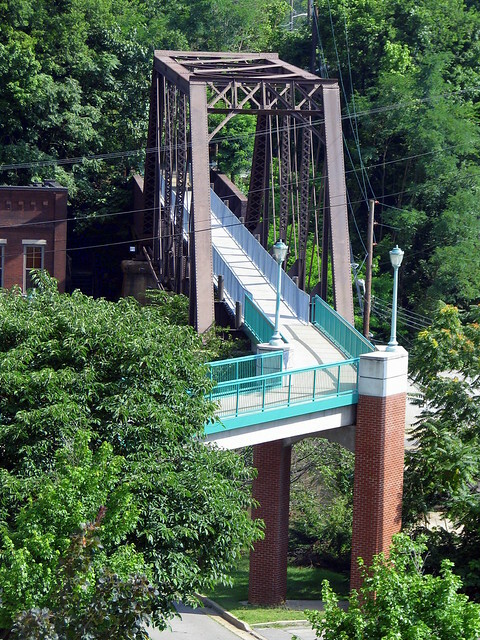 It carries the vehicular traffic which used to cross at the Shelby St. Bridge. According to the Plan of Nashville book which came out a few years ago, Gateway Blvd. will one day presumably be the best entrance into the city. 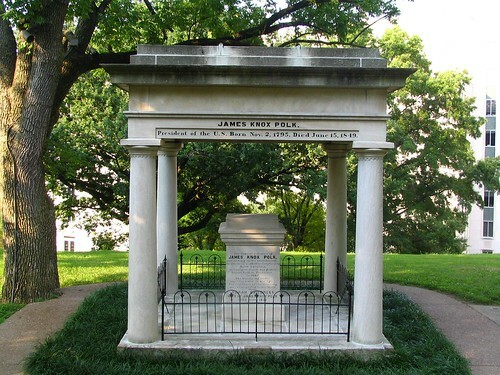 This is the tomb of James Knox Polk, the 11th president of the United States, and his wife Sarah Childress Polk. He dies in 1849, and was buried in this tomb in 1850. However, at the time, this was on his residence, Polk Place, but in 1909, was moved to the grounds of the Tennessee State Capitol hill. 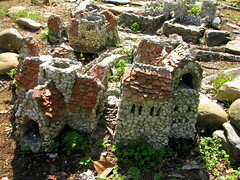 Polk Place was then torn down and the area became a YWCA. When the tomb was first built, old photos show the black description at the top with "10th" before the word "President." 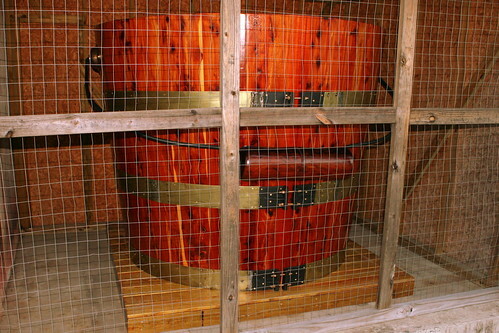 The original World's Largest Cedar Bucket was built in 1887 as a promotion by the Tennessee Red Cedar Woodenworks Company in Murfreesboro, TN. Eventually, the bucket went many places, like the 1893 Chicago World's Fair and the 1904 St. Louis Worlds Fair. 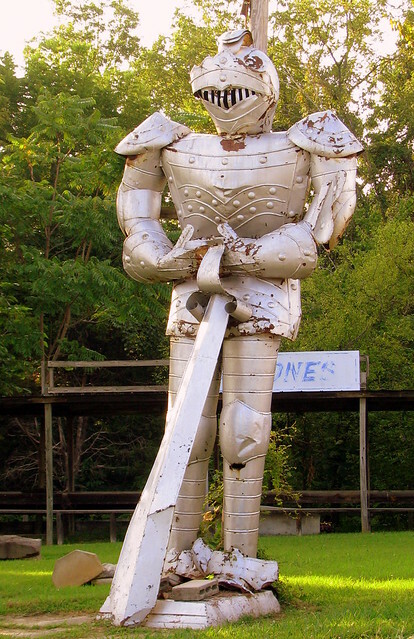 The company burned down in 1952 and a local market bought it for display for over a decade, until it was purchased by a Rossville, GA amusement park for another decade. In 1976, the town of Murfreesboro thought the bucket should come home and it became the centerpiece at the local park Cannonsburgh Village. The bucket had always been prominent in Murfreesboro's history and some even remember the nickname "Bucket town." Sadly, in 2005 someone thought it would be fun to set fire to the bucket leaving the charred, fragile remains. Like a phoenix rising from the ashes, the new rebuilt World's Largest Cedar Bucket was brought back to the Village on Oct. 22, 2011. 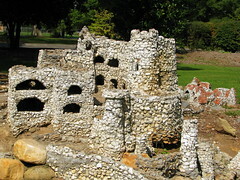 Ever since the original was burnt, the local Rutherford County Blacksmiths' Association were dedicated to rebuilding it. It took a little longer than expected to try to find Red Cedar that was the right hue, free of knots and could be cut into large enough planks. The new bucket was built to similar dimensions as the old bucket: 6 feet tall, 6 feet wide at the base up to 7 1/2 at the top, able to hold 1566 gallons. Now, it's kept locked behind a fence. All three of Tennessee's Presidents, Jackson, Polk and Johnson, stayed at this popular resting and eating spot for stagecoach travelers. 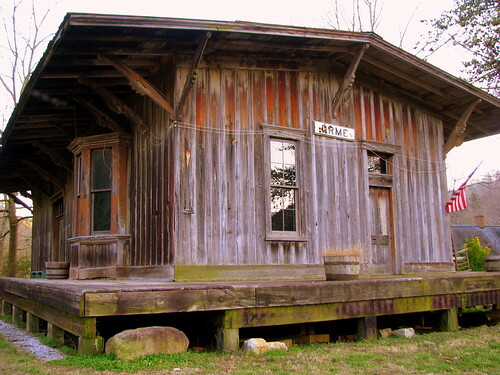 Originally, it was built as a two story log home in 1814. 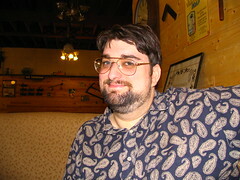 Shadrach Inman added the frame exterior in ca. 1823. 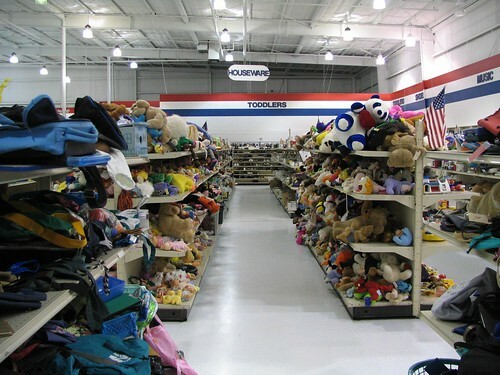 There are stepping blocks for ladies located in the front. 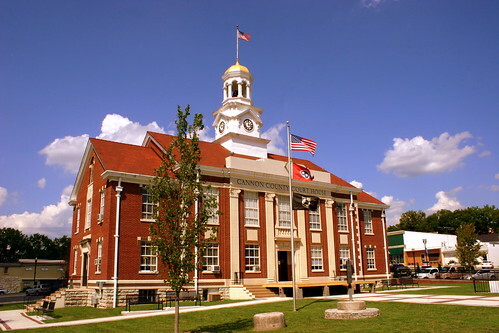 Today, it's on the National Register of Historic Places as part of the Dandridge Historic District. This view was taken from the 2006 Gay St. Viaduct. There are 11 tracks here at its widest point. 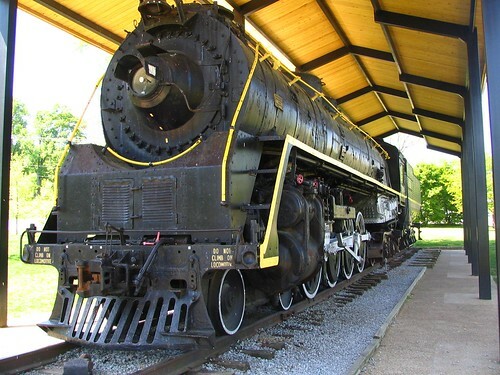 Southern Railway was formed in the 1890s at the merging of two railroad companies. In 1902, Southern hired architect Frank Pierce Milburn to design new train stations at several of their major terminals. Two years later, the Southern Terminal opened in Knoxville. Many warehouses and factories surrounded this area because of its important shipping routes. The station looks today much the same as it did in 1904, except a large clock tower was removed in 1945 wen deemed structurally unsafe. The last passenger train came through in 1970. Today, the building is on the National Register of Historic Places as the integral part of The Southern Terminal and Warehouse District, an area which is today known as Old City. 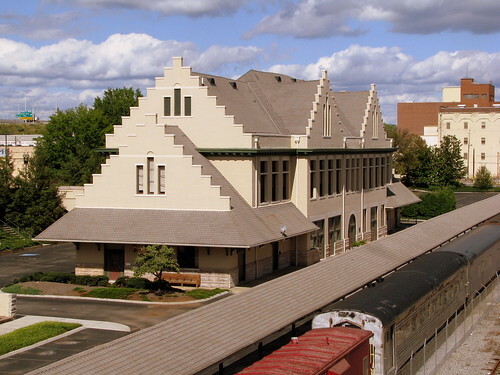 This passenger station and the freight depot next door are designed in a similar style with Classical Revival influence. Most notable is the corbel-stepped gabled roof. 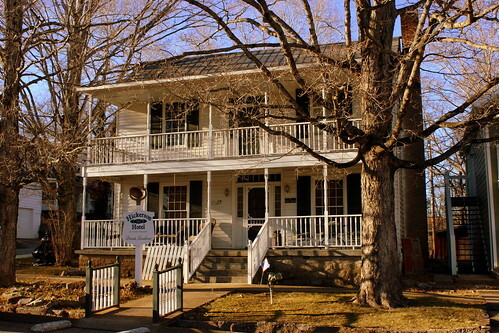 Trousdale Place is a handsome old two-story brick house serenely shaded by large trees and has been proudly placed on the National Register of Historic Places. 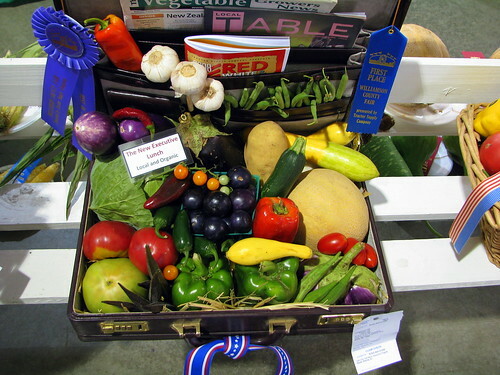 It is located two city blocks west of the Gallatin, Tennessee Public Square. This historic home was built circa 1813 by John H. Bowen, a local attorney and member of Congress. Bowen died in 1822, and the house was later acquired by Governor William Trousdale. 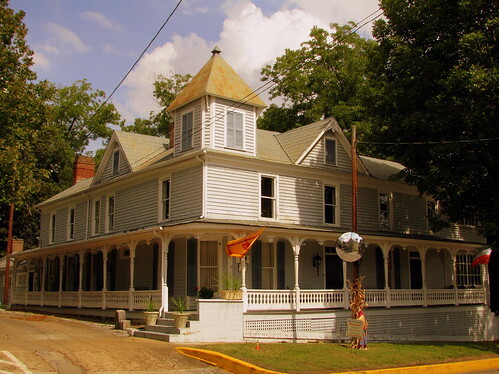 The city of Gallatin was developed on part of the original North Carolina land grant #1 awarded to James Trousdale, Governor Trousdale’s father, for his service in the Revolutionary War. In 1812, lots were sold for the construction of the jail, courthouse and other Gallatin city buildings. 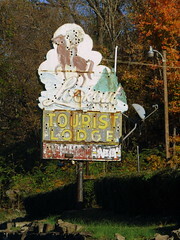 Today is 11/11/11 and I figured the best way to celebrate on the blog is by posting about U.S. Highway 11. 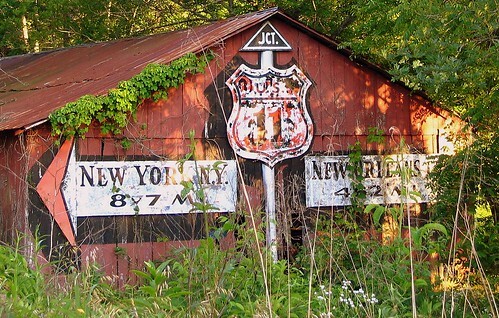 11 runs from New Orleans to New York State. While it doesn't run through Middle Tennessee, it comes close and I have driven along the route several times. 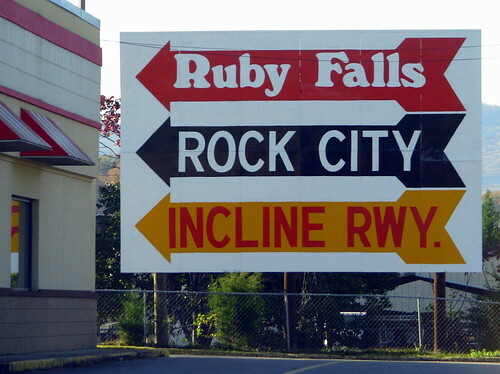 From the south, on the west side of Chattanooga, it meets up with highways US41 from Nashville, US64 from Memphis and US74 from Huntsville to be part of the Cummins Highway. 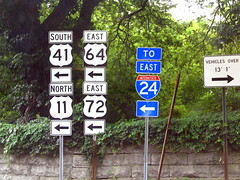 On the north side of Chattanooga, along with US64, US11 follows the path of the old Lee Highway to Cleveland. When US64 heads toward the Ocoee, 11 continues north through Athens, Sweetwater, Loudon and Lenoir City until it reaches the historic crossroads called Dixie Lee Junction, where it intersects with US70 from Nashville. Both highways pass through Knoxville, where on the other side it splits into 11E and 11W. 11E runs through Jefferson City, Morristown, Greeneville, Jonesborough and Johnson City. 11W passes through Rutledge, Bean Station, Rogersville, Surgionsville, Church Hill, and Kingsport along the Lee Highway route, Both routes come back together at Bristol. The US Highways that are two digits, odd numbered and end in a 1 are the primary North-South highways across America. 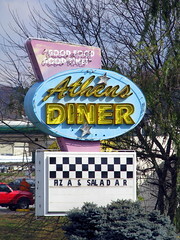 I personally have driven from Gadsden, Al to Roanoke, VA. 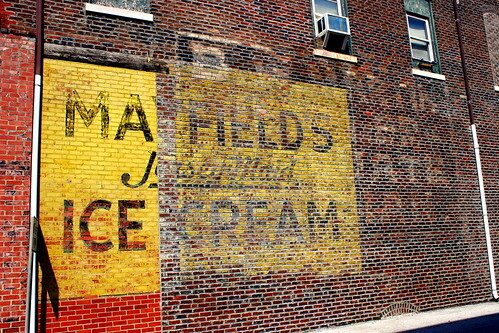 If you like old highways, there's plenty to see. 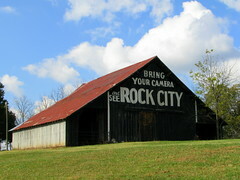 if you like Rock City barns, there are several on either side of Chattanooga. 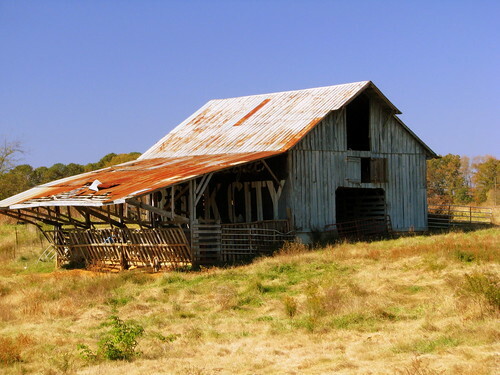 If you visit Sequoyah Caverns, when you leave, this barn gives you you're Highway 11 choice: Do you want to go to the Big Apple or Big Easy? 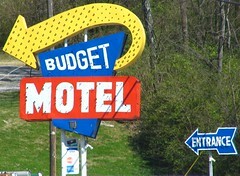 Like neon signs? 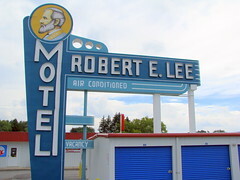 All of these are in Tennessee, except for the Robert E Lee Motel which is north of Bristol. 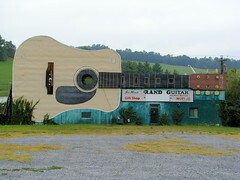 Finally, just outside of Bristol is this old Roadside Attraction along US11W, the world's largest guitar. 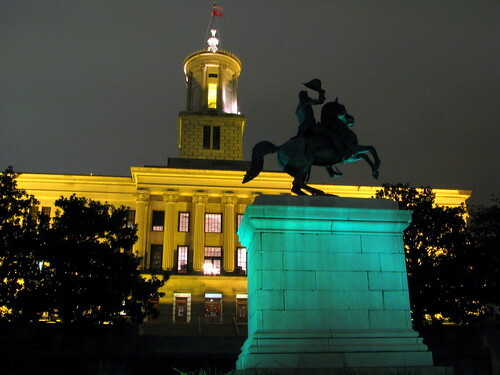 Along Capitol Hill in Downtown Nashville, at night the Tennessee State Capitol is illuminated with Yellowish lights, while the base of the Jackson Statue is given a greenish appearance. 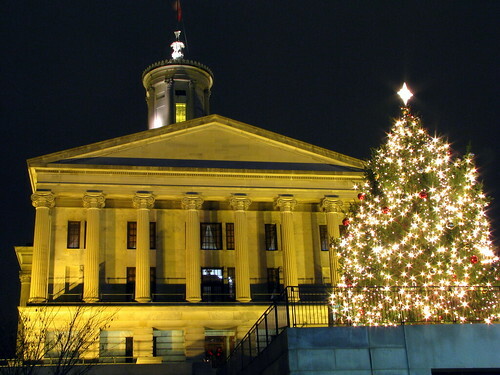 The Capitol was built in a Greek Revival design by Philadelphia architect William Strickland and completed in 1859. 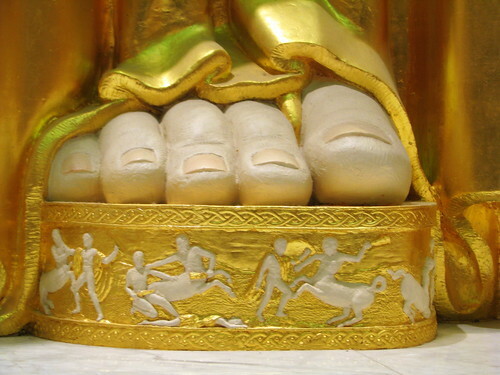 The Jackson Statue was designed by sculptor Clark Mills and placed in 1880 with duplicates in DC and New Orleans. I have no info about who made this or really what it is. 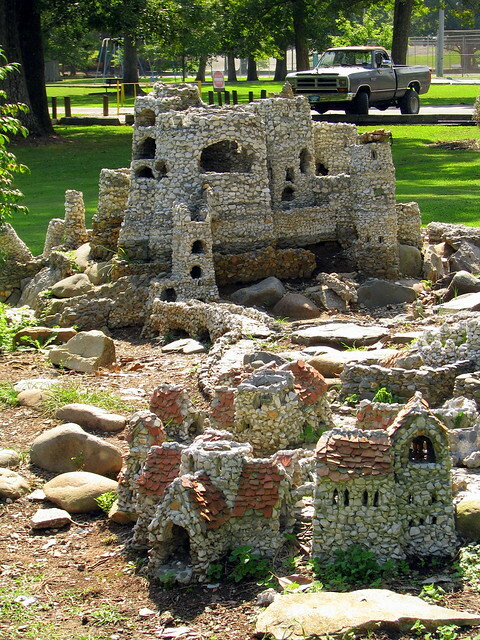 It's a little miniature village made of pebbles inside of Newport City Park. Someone went to a lot of effort to make it. 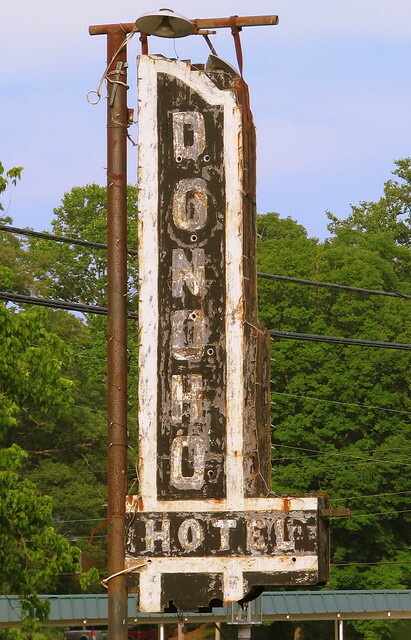 The Donoho Hotel is one of three old-fashioned resort hotels in Red Boiling Springs, TN. 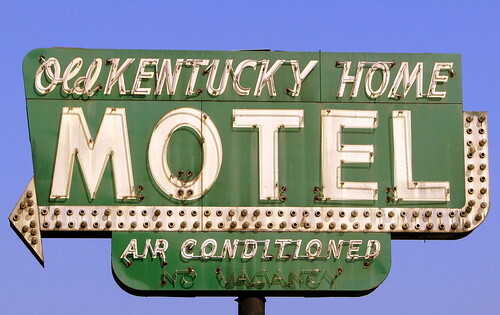 It is the only one with an old crusty neon sign. 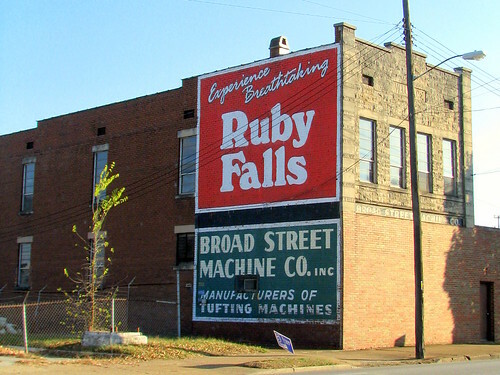 Ruby Falls / Broad St. Machine Co.
two murals, one building - Broad Street in the gritty south of downtown area of Chattanooga. 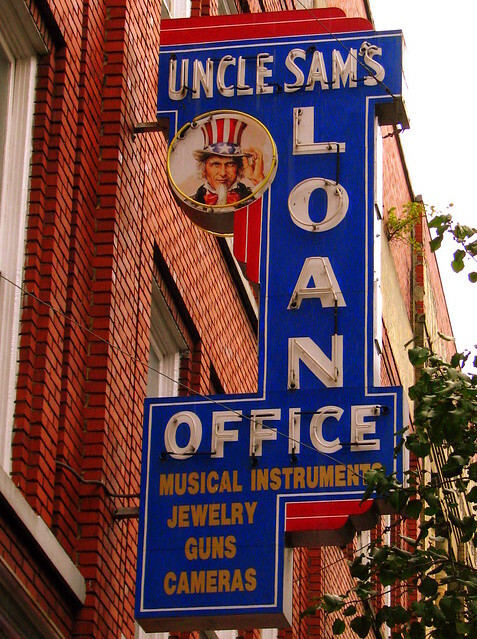 Apparently, this building is the Broad Street Machine company and they look to still be in business. I believe this is also the first time I've come across the word Tufting. This view was taken from a now hard-to-find "Old Jasper Road" which leads out of town. The Allandale Mansion was the dream home of Ruth and Harvey Brooks. 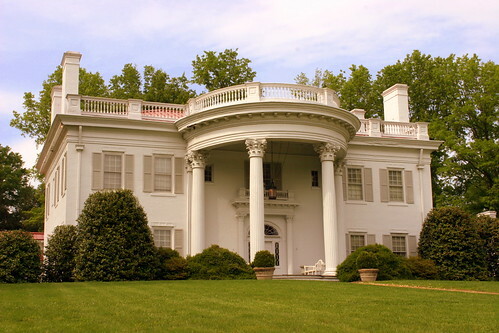 The mansion's distinctive portico has caused the mansion to be nicknamed "The White House of Kingsport." The mansion was built in 1953 and from the 500 acre property the Brooks raised Black Angus cows and Tennessee Walking Horses. 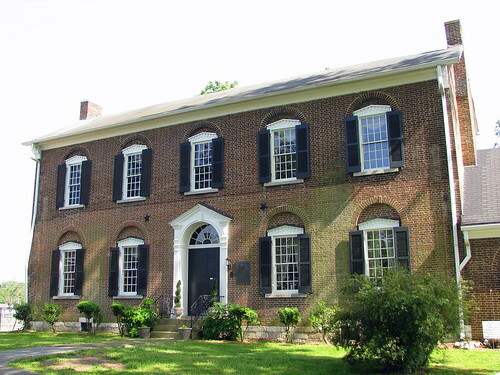 In their will, they deeded the mansion to the city of Kingsport so that it could be used by the community. The mansion is designed in a Georgian architecture style. There are four chimneys, formal fireplaces in each main room, and a hipped roof. A grand wooden curved staircase is the main feature in the foyer. 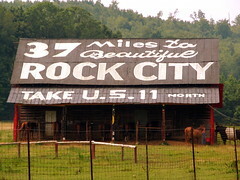 The Barn is located along US 11W (the old Lee Highway) in Kingsport, where the city extends into Hawkins County. built ca. 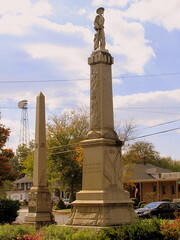 1856 and located in Charlotte's town square. 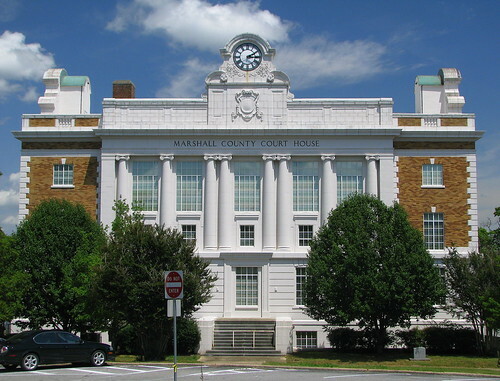 Today it is part of the Charlotte Courthouse Square Historic District on the National Register of Historic Places. I haven't spent as much time in Clarksville as I'd like, but I'm wanting to go back. There seemed to be a few of these old bridges just south of the center of town that I would like to examine when I have more time. 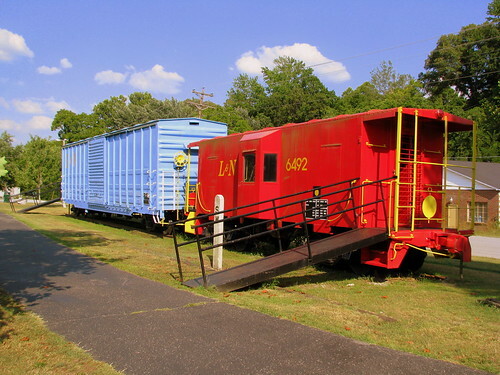 Among the things you can see in the park are a blue L&N Boxcar and Red L&N Caboose (both seen here) and a picnic pavilion made to look like a train depot, and Doc the Leprechaun.